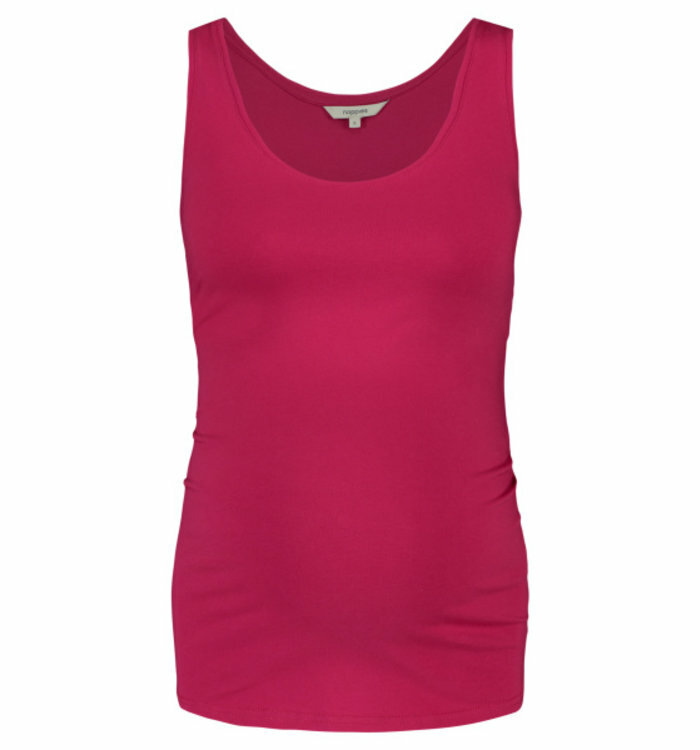 Dress stylishly and in line with the latest trends in this Oakley maternity top by Noppies. 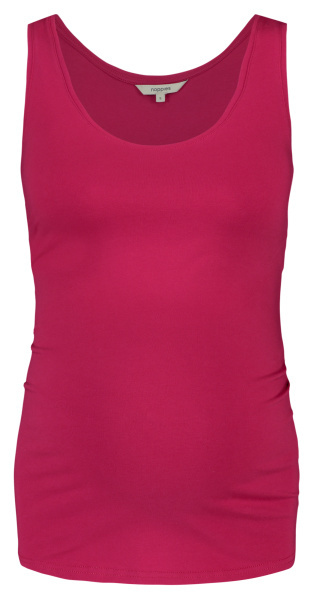 The light and airy design is made of a soft cotton blend. Because of the added stretch your baby has optimum room to develop. 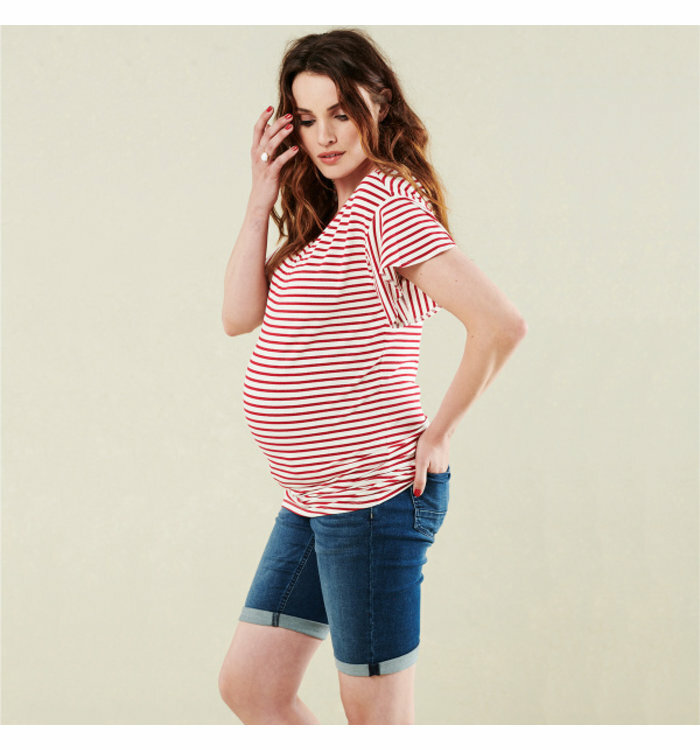 Lovely basics are must-have items for your pregnancy wardrobe. . This Amsterdam tanktop by Noppies can effortlessly be mixed and matched with other items in your wardrobe, which will ensure the item will often be chosen. 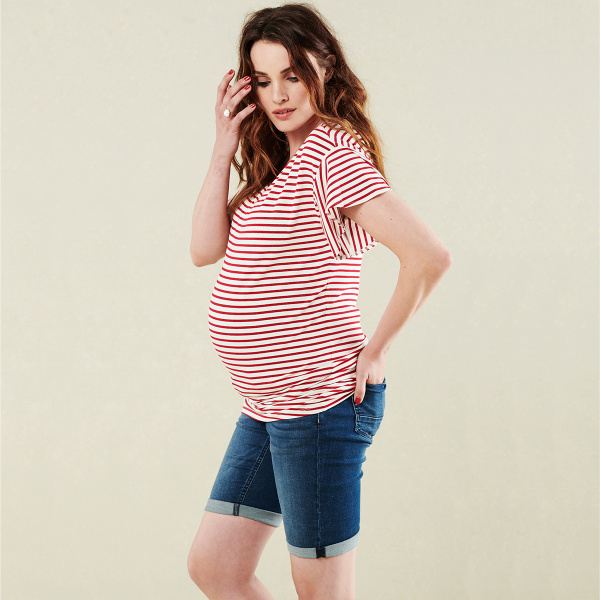 Upgrade your denim wardrobe with these maternity shorts Philo by Noppies. The denim style hits just above the knee and has turned up legs. Swimsuit Noor by Noppies in floral print. This design will support you during your nine-month adventure. The swimsuit is made of elastic material to allow your baby optimum room to grow. 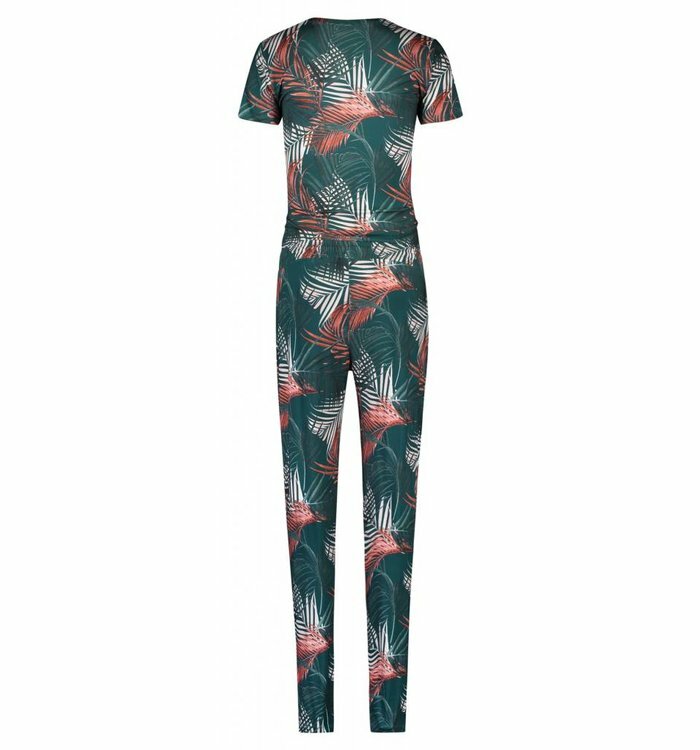 Floral prints are on trend this season. Not only do you look stylish in this bikini by Noppies, the maternity design is also very functional. The bikini top is designed to allow your body optimum room to change. 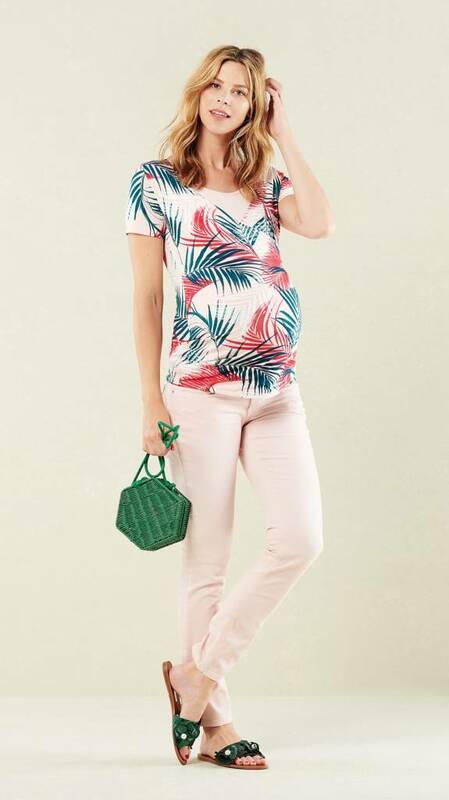 Go for a chic look with this maternity top Ophia by Noppies. 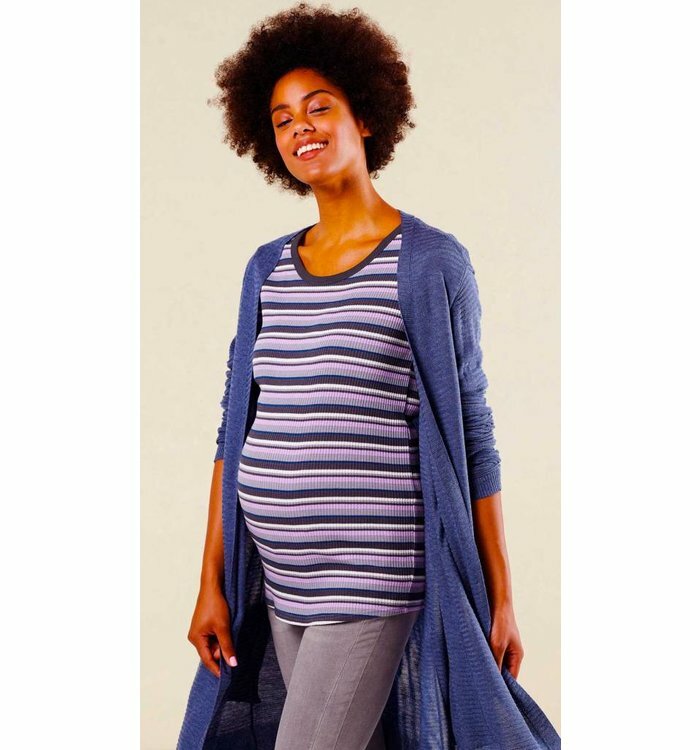 This yellow maternity cardigan Nova by Noppies allows optimum room for your baby to grow. The longer style is made of a soft material mix and the loose-fit design allows your belly optimum room to grow. Nursing dress Nadena with nautical look by Noppies. This midi style is in a subtle A-line and is made of soft material with added stretch to allow your baby optimum room to grow. 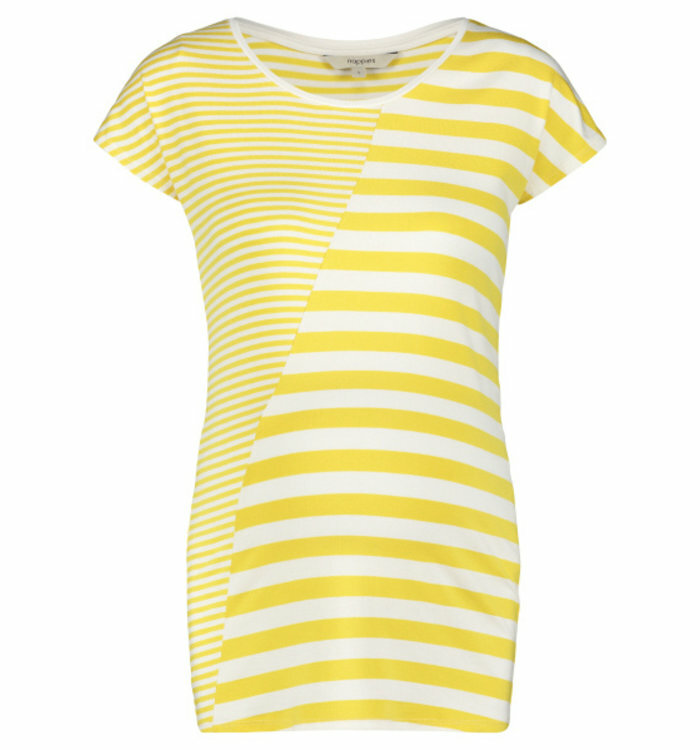 Stripes are a must this season, especially in the colour of the moment. 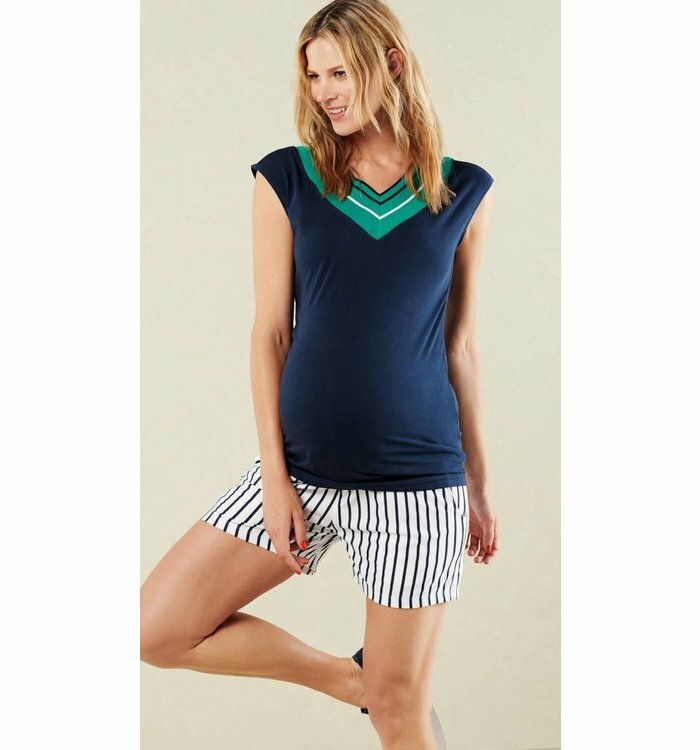 This Noni T-shirt by Noppies is designed to be worn during all stages of your pregnancy. 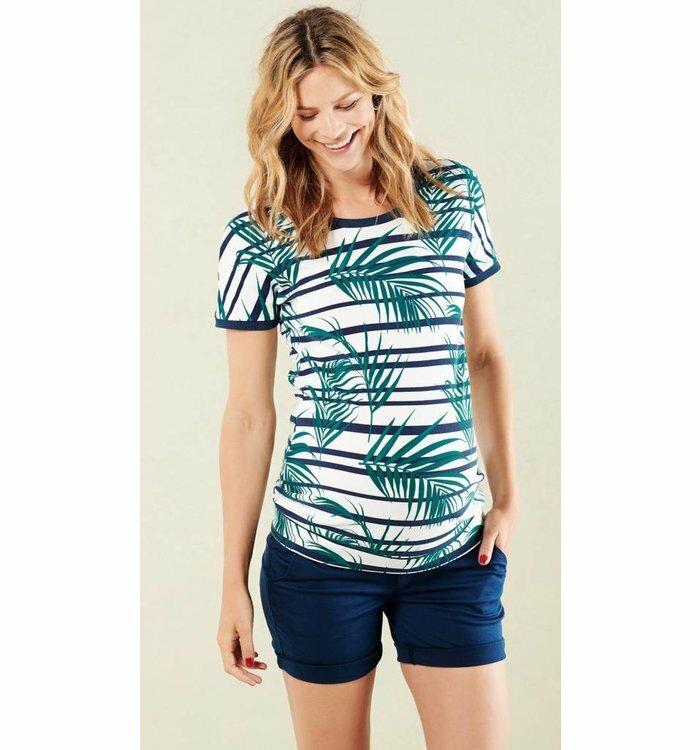 Nice and summery with shorts, or comfy with a long cardigan and your favourite jeans. 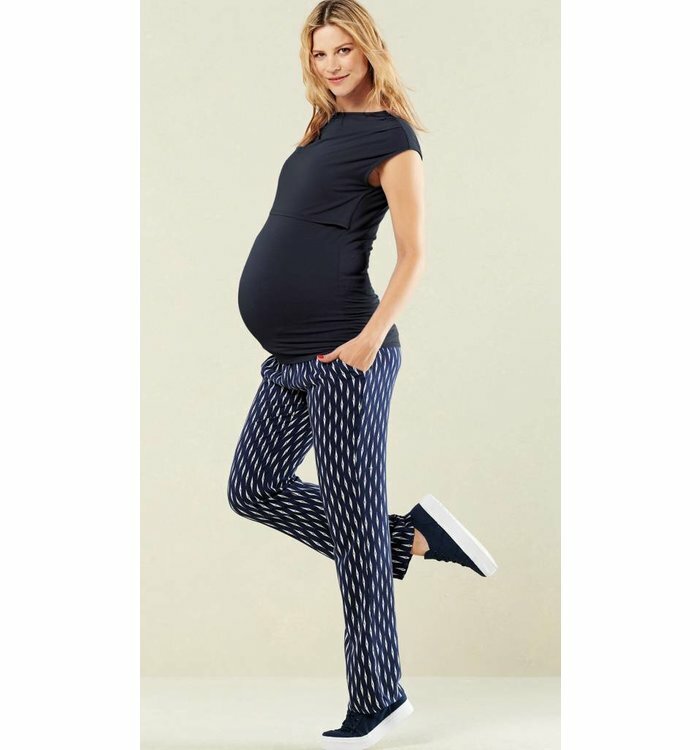 This beautiful basic with a feminine twist by Noppies can be used for effortless mix and match combinations with other items in your pregnancy wardrobe. Opt for a feminine look with this Nadja skirt by Noppies. 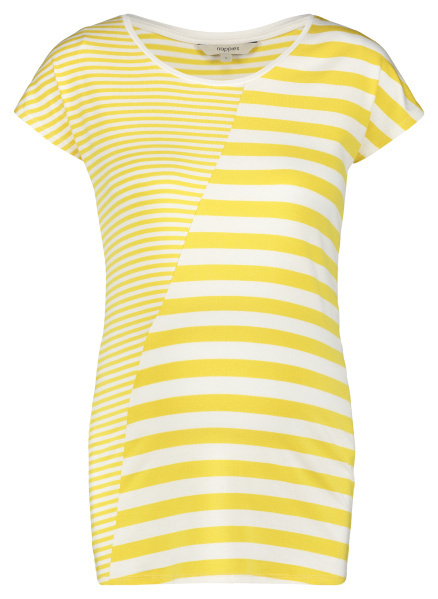 The midi style is beautifully figure hugging and comes in a stripe pattern that is both classic and timeless. The added stretch allows your baby optimum room to grow. With cropped pants you will earn your stripes this spring. This Nanda design by Noppies is made of a soft material mix with added stretch to allow your baby optimum room to develop. 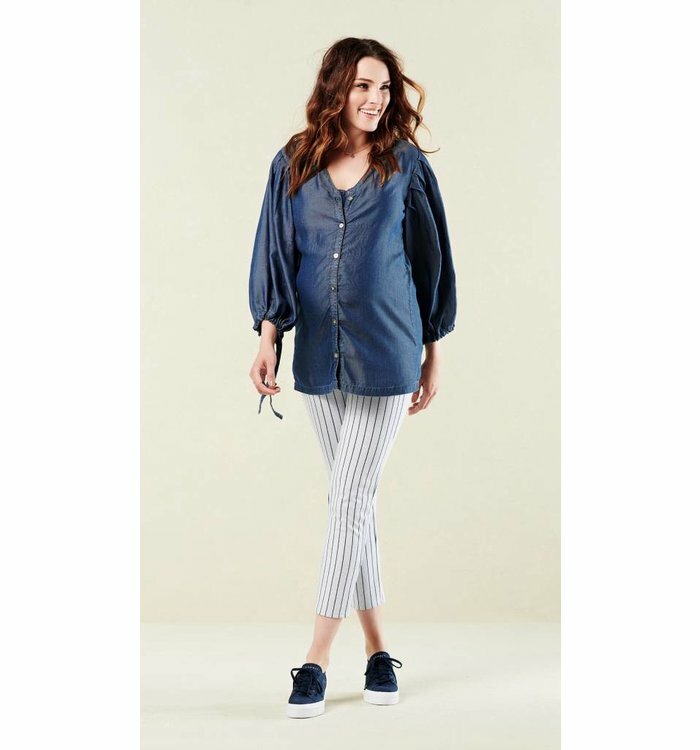 The fastening fits over your belly to provide additional support. Gold sparkly v-neck short sleeve sweater. Navy blue loose fit pants with white imprint and elastic waistband. 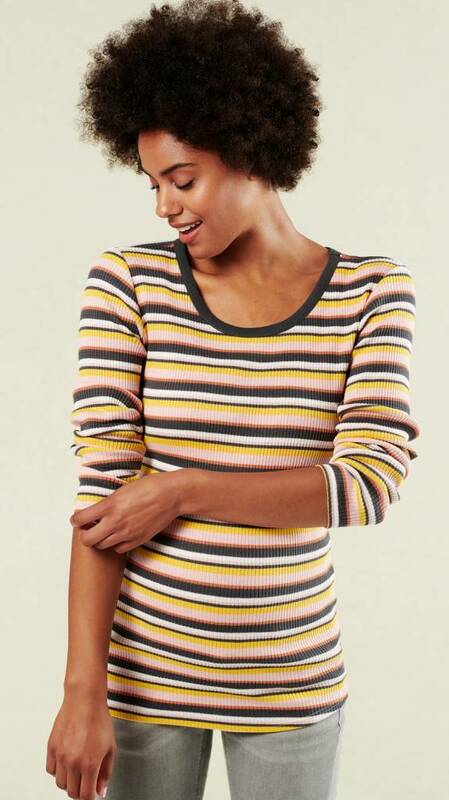 Pink, grey and white striped long sleeve sweater. Purple, grey and white striped long sleeve sweater. Dark blue jean long sleeve blouse with buttons on the front. 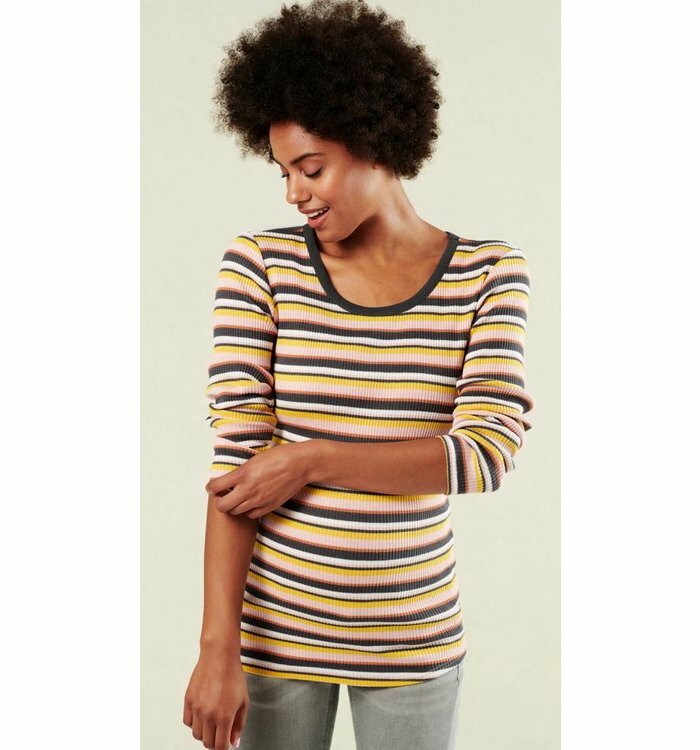 Green short sleeve jumper with white and orange imprint and laces at the waist. Navy blue cotton shorts with adjustable waist and elastic panel. 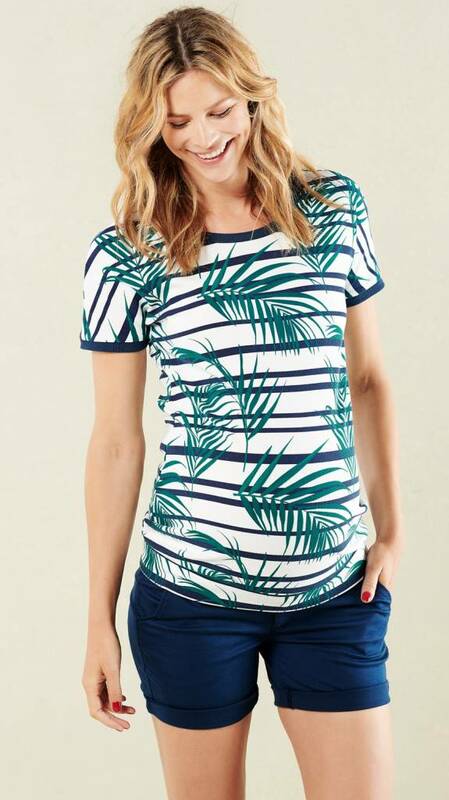 Navy blue t-shirt with green v-neck. Light blue short sleeve jean dress with buttons on the front and a belt at the waist. Light pink short sleeve nursing t-shirt with multicoloured imprint. Red and white striped long sleeve dress with frills and a belt at the waist. Navy blue shorts with white imprint and elastic waistband.